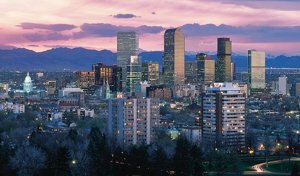 The Metro Denver area is situated on the high plains at the base of the Rocky Mountains with and elevation of 5,280 feet above sea level. Thus, one of its nicknames, "The Mile High City". Moderate temperatures, low levels of humidity and abundant sunshine provide an ideal climate for year-round activities. In fact, the area has more annual days of sunshine than either San Diego or Miami Beach. Winter storms are normally short lived, and snow melts rapidly. However, the nearby mountains and ski resorts receive significant annual snowfall, allowing residents to enjoy the best of both worlds—a mild climate for hiking, biking and a variety of outdoor activities, as well as a nearby climate for snow skiing, snow-boarding and other mountain activities. Metro Denver's climate is best described as "semi-arid," averaging a little less than 16 inches of precipitation annually. Denver's beginnings can be traced back to the discovery of gold in 1858. Denver was first a tent city set up along the banks of the South Platte river as prospectors followed quickly in the pursuit of this gold. Denver since has had two other economic booms. After gold was silver and then in the late 1970's and early 1980's came the oil boom. The professions of landscape architect and city planner were seeking definition in 1893 when the Columbian Exposition in Chicago provided a showcase for their ideas. Mayors and civic leaders were seeking ways to beautify their cities, to correct the errors made from haphazard growth that took place without the benefit of planning or zoning. The Exposition spawned the City Beautiful Movement which emphasized planning, Classical and Revival architecture, and the value of parks and landscape design. The City Beautiful Movement found its Denver champion in Mayor Robert Speer who supported parks planning and hired Holland-born landscape architect Saco Reink DeBoer. Speer promoted architectural design by featuring pictures of recently built Denver homes in his official city organ, Denver Municipal Facts. These were residences he deemed worthy examples for a great city. More than fifty percent of the residences featured were in the East 7th Avenue Historic District. Residences favored by Denver's wealthy during the post-Victorian era (1890 to World War I) were mainly in the Neoclassical, Colonial Revival and Mediterranean Revival styles. The City Beautiful Movement highlighted the grandeur of classic Old World and New World styles as an elegant expression of social status. Leaving Victorian fussiness behind, the elite sought symmetry and historical correctness. Astonishingly, of the hundreds of mansions erected between 1880 and 1920 in the downtown area and in Capitol Hill, relatively few have survived. Some of the great old homes of Denver still stand with all the dignity and substance that were built into them and some have gone forever, their locations shadowed by skyscrapers. Some have passed through successions of private ownership and remain residences of distinction. Others have become headquarters of organizations, clubhouses, business offices or apartments. A few of the finest homes remain intact in the tradition most befitting their original concept. These are the gracious homes of families who carry forward in descending order the names and works of those who built them and founded a western empire as well.